In an ideal world, recruiters, hiring managers, and everyone else involved in the hiring process would be perfectly aligned. Yet most of us have had frustrating experiences due to an unstructured approach to hiring. 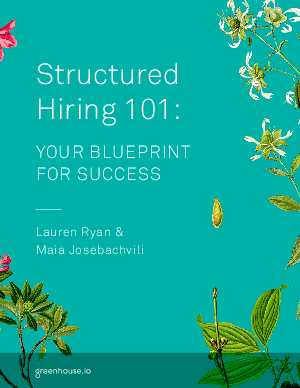 That’s why our VP of People and Strategy, Maia Josebachvili and our Director of Talent Acquisition, Lauren Ryan, teamed up to write the Structured Hiring 101 eBook. The Structured Hiring eBook is your blueprint to success. Download your copy today!